Beloved and I ate at Amici a couple of times over the past couple of months. The first time was dinner on a whim, looking for what’s open. Amici happened to sound satisfying as I was craving pizza that day, and so we went. For those who don’t know, this Italian place serves genuine Italian dishes not limited to pasta and pizza. They also carry risotto, isalata, zuppa, and their own gelato brand among other house specialties, or il favorito dela casa. I wanted to try out their Artichoke and Portobello Flatbread Pizza, but they were out. 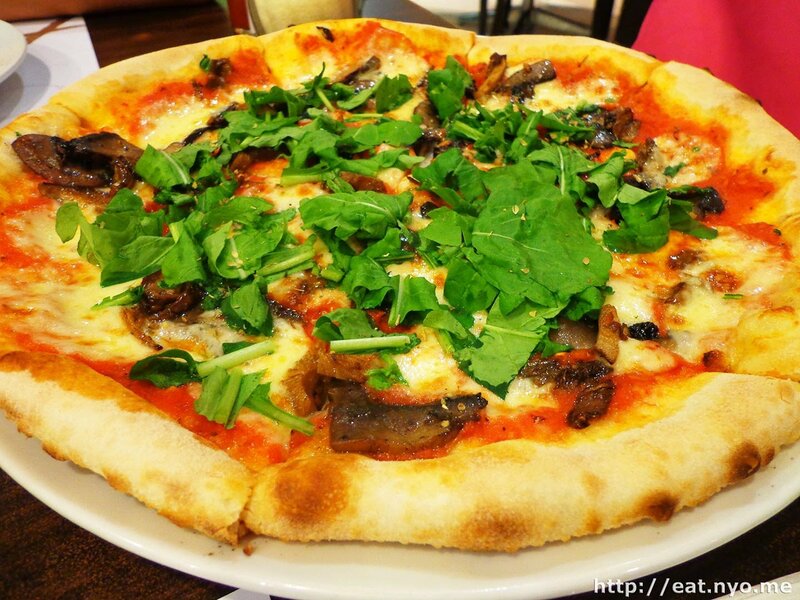 Instead, we settled for their Truffle Mushroom Pizza (435 Php). 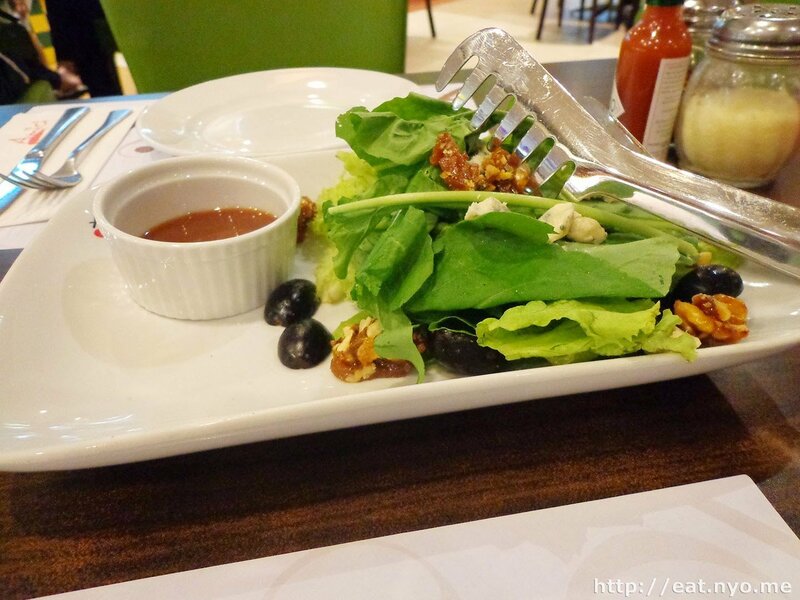 Because it felt like it wouldn’t satisfy the two of us, we also got their Mediterranean Blue Cheese and Walnut Salad (205 Php) from their selection of insalata. Finally, Beloved ordered their Cafe Mocha (125 Php) because she wanted to. The Mediterranean Blue Cheese and Walnut Salad looked deceivingly plenty. The fresh leaves they used still had a lot of crisp to them, carrying even the relatively heavy walnuts maintaining their shape. Apart from the nutty arugula, I’m not actually certain of what specific leaves they used. The sweet and crunchy walnuts paired with the black olives and sharp blue cheese quite nicely. Even without the sour red wine vinaigrette, I found it satisfying, albeit quite light. The Truffle Mushroom Pizza arrived, covered in chopped greens, which was probably arugula on a cheese-and-sauce laden 10-or-so-inch pie. The crust was wonderfully crisp. The mushrooms included were portobello, shitake, and porcini. I couldn’t tell much difference between the fungi, but the fragrant truffle oil it claimed to have certainly increased my appetite. Perhaps too appetizing that it left both of us still hungry after quickly consuming the entire pie. We stopped there, though. The bill was already nearing a thousand pesos and we were barely full. 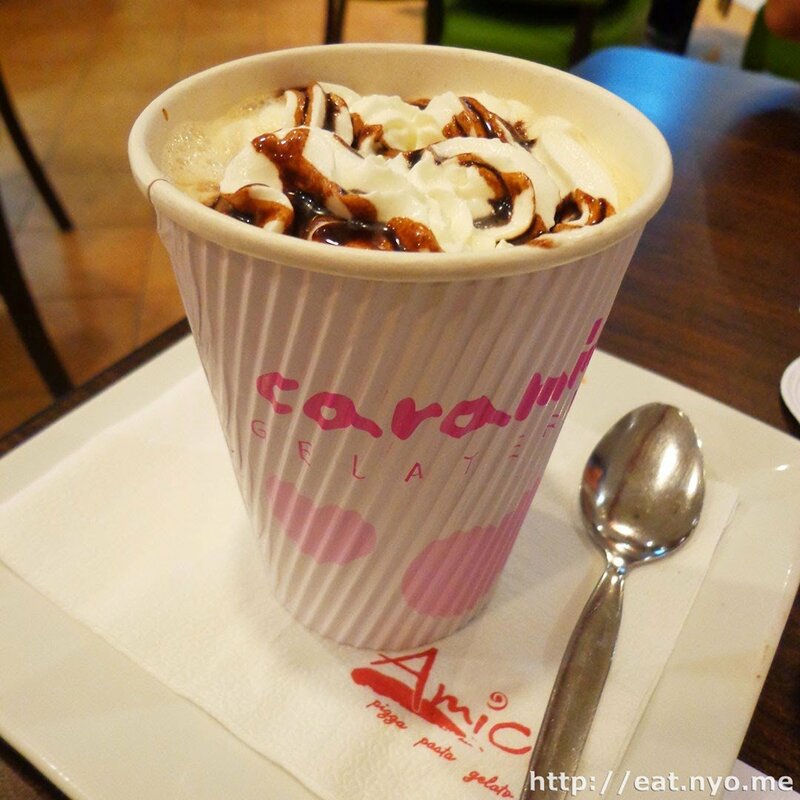 Beloved still had her Cafe Mocha to enjoy, but it certainly didn’t help us staying starving. It took us a while to go back as it left us being able to consume the a hot pot from Hanuri immediately afterwards and concluding that this wasn’t the place to go to when hungry. We can’t deny, though, that the food was delicious. So eventually, we did. 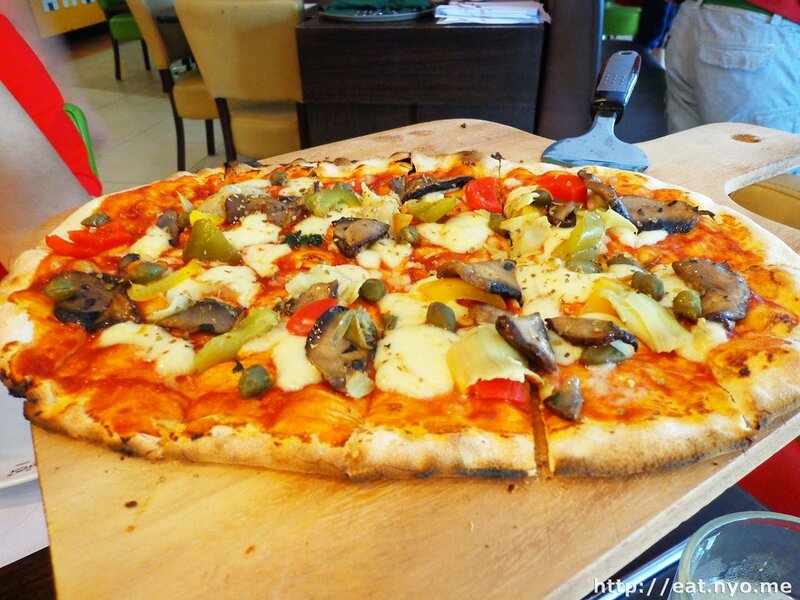 This time, the Artichoke and Portobello Flatbread Pizza (315 Php) was available so we got that. Since we know it wasn’t gonna fill us up, we opted for a hopefully heavy course between pasta and risotto. We settled for the latter and got their Risotto di Mare (335 Php). 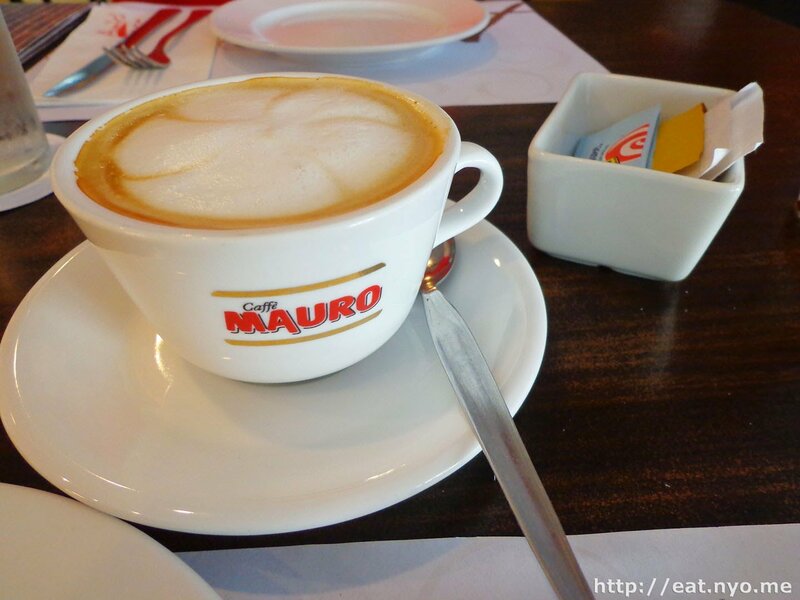 This time, Beloved got a cup of hot Caffe Latte (75 Php) pictured above. The Artichoke and Portobello Flatbread Pizza was a oblong instead of a circle, and a bit flatter. Aside from the aforementioned artichoke hearts and portobello mushrooms, there were also capers and bell peppers. While having a lot of body, it wasn’t as flavorful as our first pizza here. However, it was similar to the first in that it wasn’t filling. Finally, the Risotto di Mare. This is a seafood risotto. The spoon pictured is a bit larger than the usual spoon, but I must emphasize the “a bit”. It’s a pretty small serving, about a cup’s rice worth of risotto. However, it looked as if there was almost a one-to-one ratio in amount of seafood and rice in this plate. There were shrimps, mussels, clams, scallops, and squid covered in a bright red sauce. 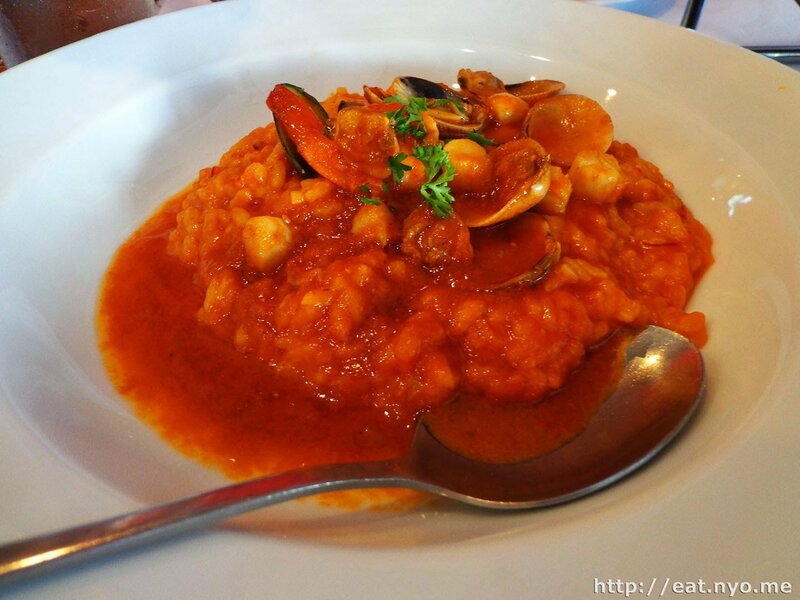 Although red usually means hot, this one’s a tomato sauce, giving the dish quite a savory flavor. Still, it didn’t fill us up, as expected. Do not go to Amici if you’re hungry. Go here if you want to experience delicious food and have a bit to spare. This place is perfect for those days where you’ve had a nice, heavy breakfast or lunch and want something nicer but not filling for dinner. Or the reverse. Or if you want something flavorful but not heavy. Anyway, two out of two visits, we spent more or less a thousand and didn’t get full. However, two out of two times, our palates were definitely sated here in Amici. Recommended for: Not-so-hungry Italian food lovers. Not recommended for: Starving plebeians. Smart nomnomnom tip: Perhaps it’s better to think each dish is good for one (not sure about their pasta).